As mentioned in my last post, I was thrilled to attend last weekend’s grand opening of two temporary exhibits at the William J. Clinton Presidential Center in downtown Little Rock starring SNOOPY! Oh, and Charlie Brown, Lucy, Linus, and all the others too. 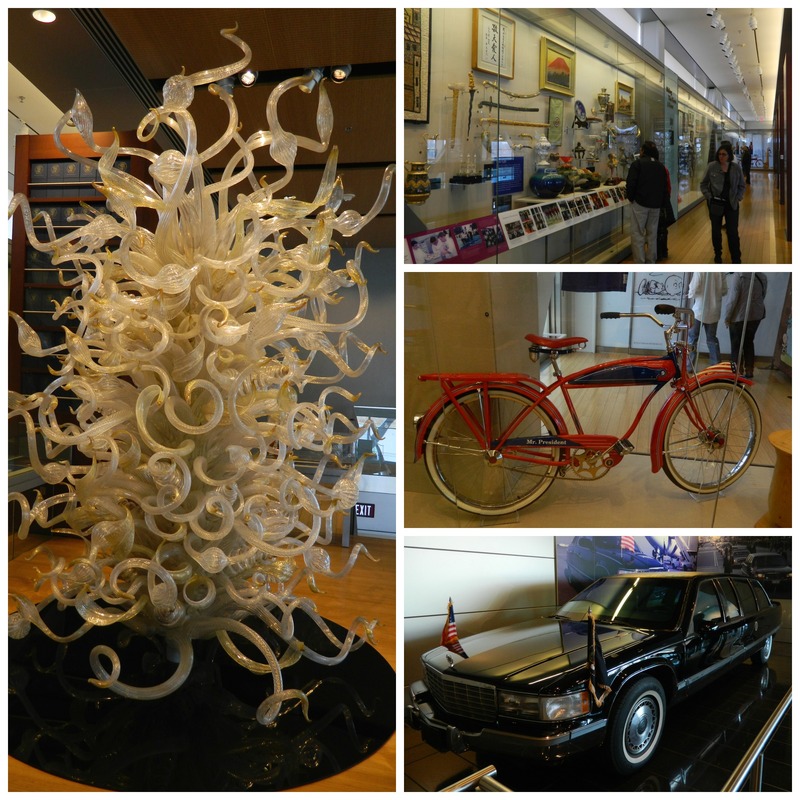 After checking out those exhibits, it was fun to also visit other areas of the building since I hadn’t been before. 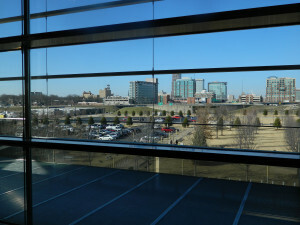 The Center, which is located next to the Arkansas River, incorporates the presidential library of Bill Clinton, as well as the Clinton Foundation and the University of Arkansas School of Public Service. While there, we explored parts of the main building/library. 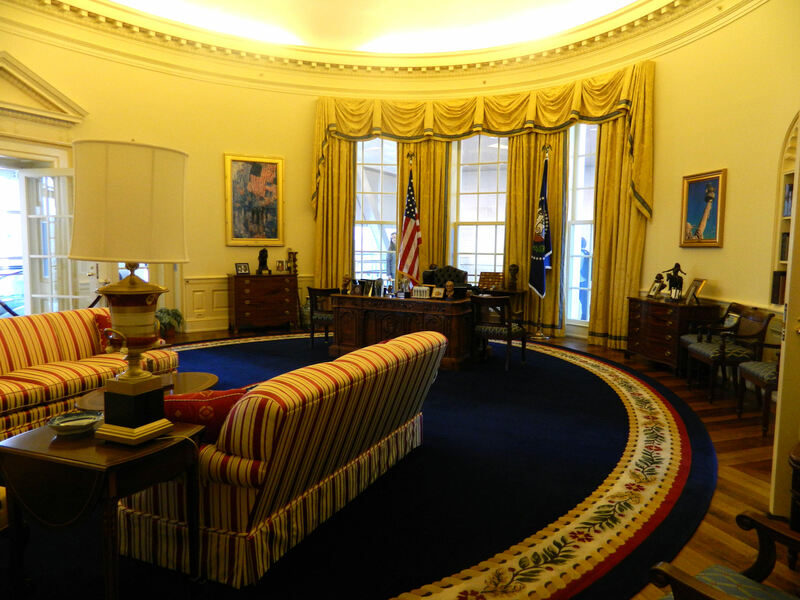 My favorite part was the full-size replica of the White House’s Oval Office from the time President Clinton was there, including decorations, draperies, his desk, and even a Norman Rockwell painting given to him by filmmaker Steven Spielberg – shown on the wall to the right of the desk. It was also interesting to check out some of the many displays about his time before, during, and after the presidency. 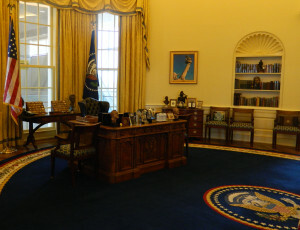 The “during” section showcased some of the many gifts that were given to the President during his 8 years in office, including a cool-looking bicycle stamped “President” and all types of saxophones. As a HUGE Chihuly fan, I was also excited to see one of the two actual Crystal Trees of Light that Dale Chihuly created for the First Family in 1999, and which was displayed in the Grand Foyer of the White House. Gorgeous! 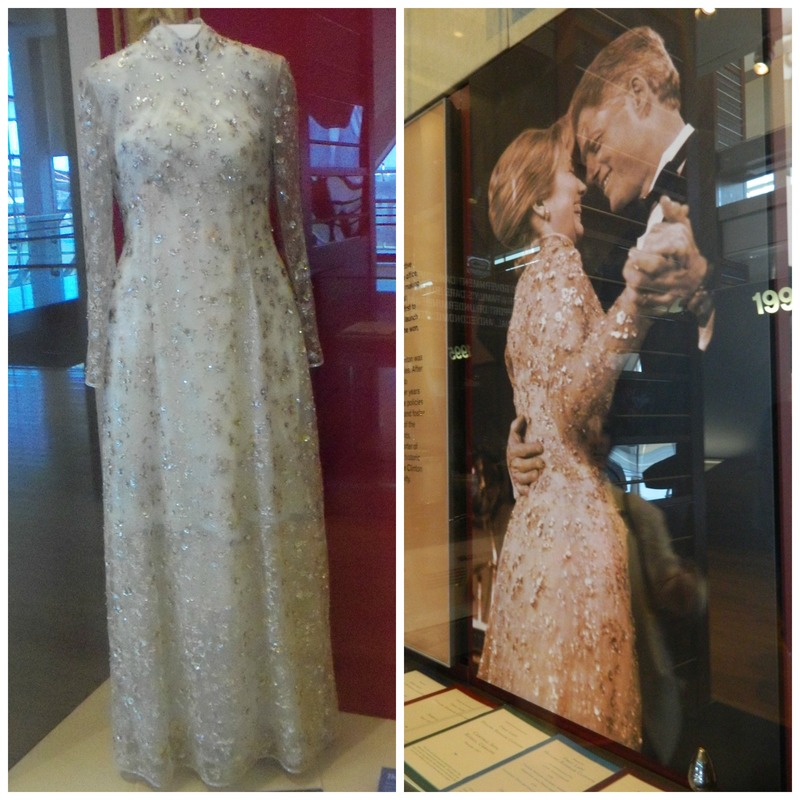 My Mom’s favorite thing was seeing Hillary Clinton’s 1997 inaugural gown designed by Oscar De La Renta. This exhibit really reminded me of displays at the Smithsonian Institute in Washington, DC. 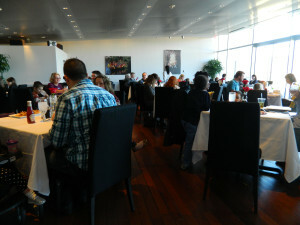 After investigating the sites, we were happy to take a break for lunch at the Center’s restaurant, Forty Two. (Named because Clinton was the 42nd president.) Nothing like sitting under the watchful eyes of the former President and First Lady! 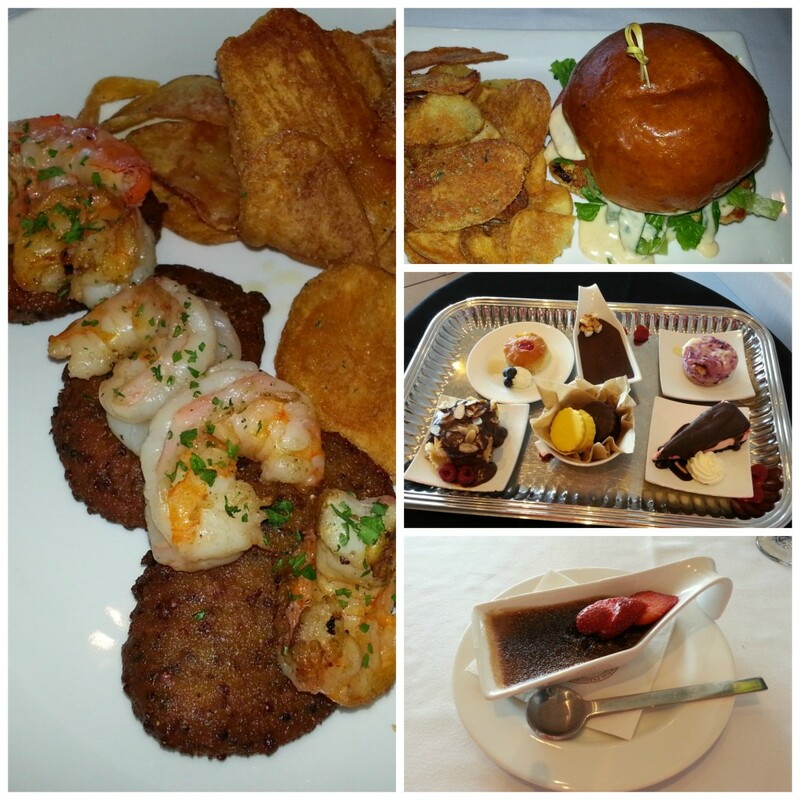 The food here was wonderful, with a giant turkey burger with queso cheese sauce and hand-cut fries for my Mom and pan roasted shrimp on “buttermilk-quinoa corn fritters” for me. Yum! After looking over the dessert tray (which included miniature moon pies! ), we chose to finish up with crème brulee. This dessert was a little strange in that it actually tasted more like chocolate pudding with a cooked sugar top crust, rather than the crème brulees I’ve had in the past. But mixing in the accompanying fresh strawberries turned it into a delight. Yum again! Overall, I enjoyed this very large and very interesting place. As with most museums, it’s impossible to see it all. (I mean, the main building has 20,000 square feet of exhibition space!) So we took our time and enjoyed what we saw – and will be sure to come back again. Soon! 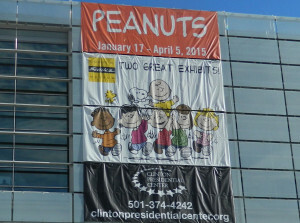 NOTE: I was invited, along with several other bloggers and their families, to attend Opening Day of the Peanuts Exhibit. The Center also provided lunch free of charge, but all opinions — as always — are my own. 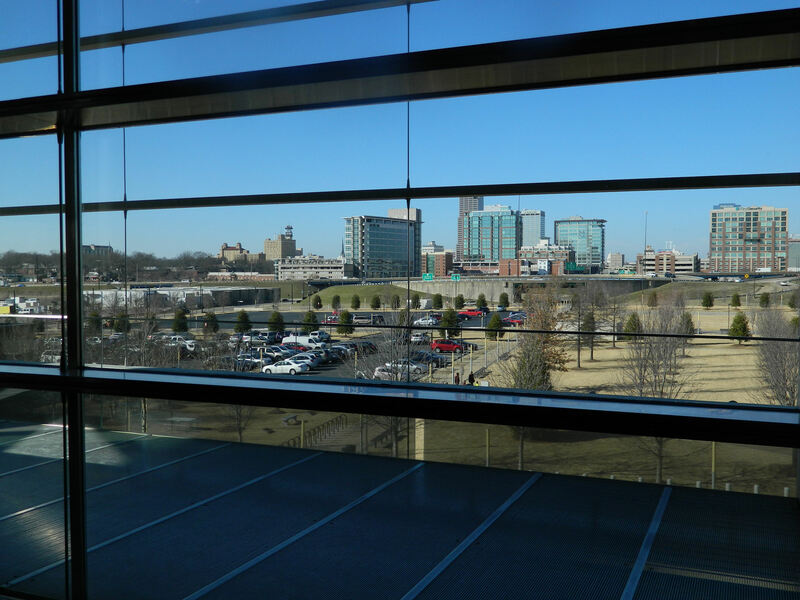 Love this article….next time you decide to mosey to Little Rock….let me know…would love to tag along. It’s a deal Darlene! Looks like there’s a lot to explore there. Looks like such a cool place! I’ve never been to a presidential library. Kinda silly considering one is right here in my own state. 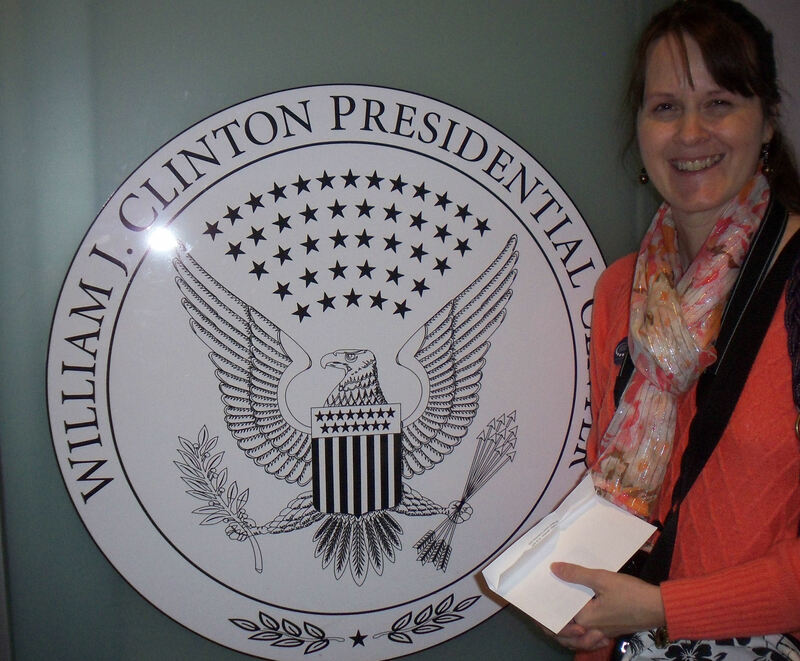 I’ve never been to the presidential library, but I think it’s so cool I live so close to one now. Will definitely have to have a mini adventure and check it out one day. Love the idea of a mini adventure — anywhere! I think you’ll enjoy the Clinton Center Sarah. Really, really interesting. What an adventure. 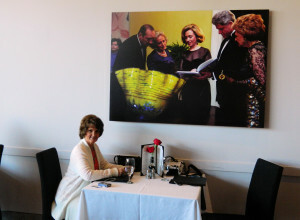 There was so much to see at the Clinton Museum, and not enough time to see all I wanted to. I will definitely be going back when I’m not in a hurry. I recommend it to everyone. Thanks for sharing the great pictures and wonderful story. Thanks for the compliments! And I agree about the recommendation. 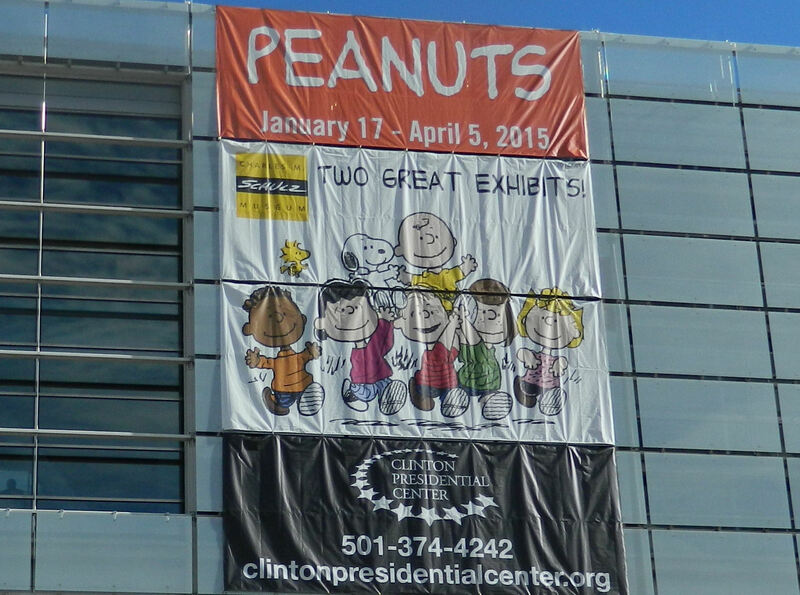 By also having fun temporary exhibits, like the current ones on the Peanuts Gang, they really do seem to have something for all ages. You are so right about that dress…it definitely brings the Smithsonian to mind. I’m glad you chose not to add that the diners beside you brought two completely grumpy and overtired miniature humans who screamed and acted crazy throughout the meal. Ha Amy! They were just tired (and adorable!) Completely understandable.